Centennial Bank is a customer focused bank that provides a broad range of commercial and retail banking and related financial services to businesses, investors, individuals and municipalities. 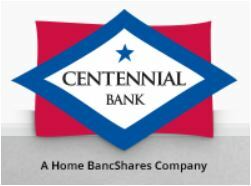 Centennial Bank has locations in Arkansas, Florida, South Alabama, and New York. We pride ourselves on excellent customer service, convenience to our account holders and taking care of the communities in which we operate. A group of investors, led by John W. Allison, Home Bancshares’ Chairman of the Board, and Robert H. “Bunny” Adcock, Jr., Home Bancshares’ Vice Chairman of the Board, formed Home BancShares, Inc. After obtaining a bank charter in 1999, First State Bank in Conway, Arkansas was formed. Later, Home Bancshares acquired and integrated Community Bank, Bank of Mountain View and Centennial Bank in 2003, 2005 and 2008, respectively. Home BancShares and its founders were also involved in the formation of Twin City Bank, which they formed in 2000. Allison also helped with the formation and acquisition of Marine Bank of the Florida Keys in the 1990’s and then brought it into the Home BancShares family in 2005. Home Bancshares’ banks are built around experienced bankers with strong local relationships. In 2008 and 2009, we collapsed all charters and pulled all banks under the brand, “Centennial Bank.” This major integration allowed us to better serve our customers, employees and shareholders. We continue our tradition as a cornerstone institution in our communities and our customers enjoy local service that is both personal and professional, all within the Centennial Bank name. We will continue our tradition of being a good corporate neighbor and continue to serve our customers personally, professionally and locally under the Centennial Bank name. Thank you for your support and patronage over the years, and we look forward to serving your banking needs for years to come.